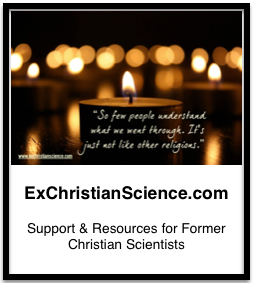 A little while back someone told me about a new ex-cs blogger, Hester, and her blog, Incredible True Stories of Christian Science Healing. I clicked over, skimmed it, bookmarked it for later and forgot about it. This afternoon I had a few spare moments, the small ones were occupied with something that was too quiet, but probably safe because no one started to shriek for Mommy! like the world was ending. Lies resonated in an uncomfortable way, of course CS children lie, how else do you think all those miraculous healing happen? It was my job to keep my mom feeling okay, and that job required either perfection, or the appearance of perfection. There may be some Christian Science parents out there who can roll with imperfection, but they aren’t the majority, and they sure as hell weren’t in my family. In my family, it was my dad, and if we couldn’t be happy, or behave, or whatever, we could fake it. I got very good at faking it. Hester’s Incredible True Stories hit all the emotional buttons, on topics I continue to struggle with. These are all topics I don’t have the emotional energy to write about…. I’m not sure I have the emotional energy to read about them, but it is comforting to know I’m not the only one confronting these issues. Thank you thank you. Jan 25 I had major double surgery and could NOT figure out the pain numbers or pain faces. They’d say something like has it really gone from two to nine that fast? I could not answer with any reasoning and couldn’t figure out why.